Our Amish Flat Wall Curio Cabinet features a solid wood, bow-shaped frame with glass sides and a mirrored back. This compact curio cabinet is built to be a hung on a wall. Two glass shelves will support your favorite mementos and collectibles, and a touch lighting system will help bring out their shine more. 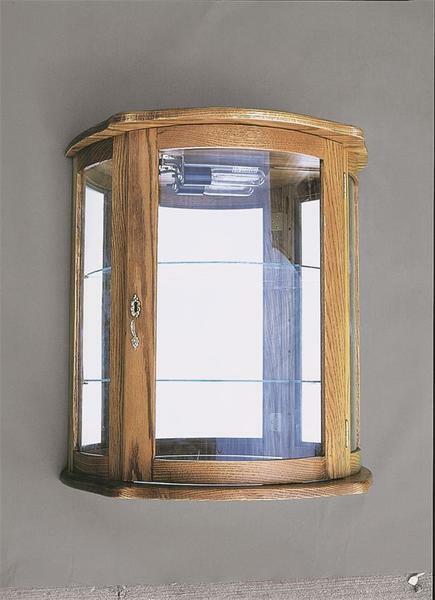 This hanging display case can be made from your choice of wood, finish, and hardware from a variety of options. *If indoor delivery is selected, please note that your new curio cabinet will be brought into the home, but will not be secured to the wall or installed.